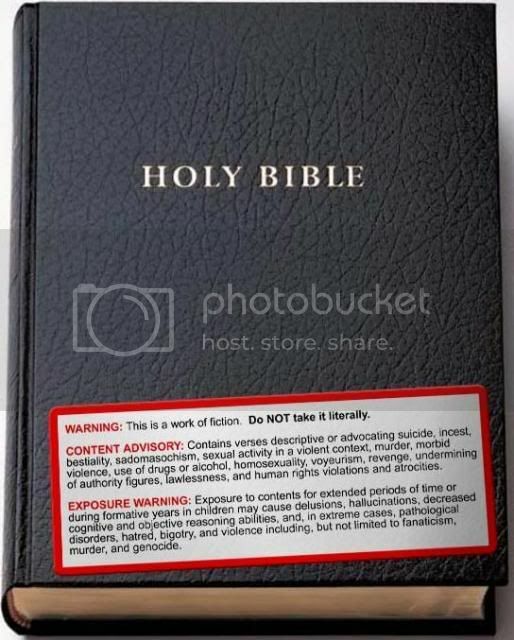 First thing that came up when I Googled "bible" and "fiction." Would it burn your hand to pick up a bible and read? This is what gets me about believers. They think the only reason we donâ€™t buy into their nonsense is that we havenâ€™t dared to read their so-called holy book, yet. Reading the bible like a textbook is not as easy as it seems. You may be bogged down in the genealogies or the construction of the Jewish temple and then when you get to the real word of Jesus, you are part asleep. For much of the bible, you need a scholarly Baptist preacher to guide you through the meanings and revelations. Jesus spoke in parables so that the people of God could understand him, but those not of God could not. You cannot read with a hardened heart. In Carolina, I know there are Baptists who can show you the light. They may even come knocking at your door offering pamphlets about salvation and the Good News!!! You should note that the good news is regarding salvation from the hell!! Prayer works for true believers if it is in God's will, and I will make a prayer for you to find the Lord and reject Darwin and Satan too. I do not understand why some people think the world lasted so long before the time of the Great Flood. When you see the truth, you can stop pretending like you were born from a monkey. Glory! Jesus Loves Dinosaurs-- Even the dirty-hippie vegan ones. Reading the bible like a textbook is not as easy as it seems. You may be bogged down in the genealogies or the construction of the Jewish temple and then when you get to the real word of Jesus, you are part asleep. I spent more time on the gospels than any other part of the Bible. That's one way you can tell the deluded: they make these kinds of assumptions. For much of the bible, you need a scholarly Baptist preacher to guide you through the meanings and revelations. Jesus spoke in parables so that the people of God could understand him, but those not of God could not. I was a Christian at the time. Had been all my life. You cannot read with a hardened heart. I didn't have a hardened heart. The Bible does not make sense. Deal with it. Yes, it's true: I wasn't born the towering, insightful intellect you see before you! And I bet you werenâ€™t as modest, either. Conservative Christian, I take it? It's not us atheists' fault the bible is so poorly written. Well, that was just one of the many ways people can go wrong reading the bible on their own-- I didn't say it was what your problem was. I think you need to spend time with some good southern Baptists. Some people just cannot accept that there are mysteries in life, and one of these mysteries deals with reading the will of God and the parables of Jesus. Mr.Bogosity, today I would like you to reflect on the parable of the Unpopular Banquet: Matthew 21:1-13, Luke 14:16-23. I believe you will learn much within it's pages!! And 'ha-ha' to the guy saying God invented evolution... He invented it like your mom invented crabs (that's my joke). The funny thing you should know about fossils is that they are not actually bones. They have been supposedly "replaced by minerals"-- which means they are essentially rocks. What a lot of these people do, is carve up stones so that they look like bones and they then have an erector set to make all these fantastical creatures. Many of them are too absurd to comprehend, but you will buy anything these people sell. Now, not all of them a frauds of course, some of them are from the devil instead and should be pulverized to let the demons escape. It is sad the lengths that satan will go to to send people to the hell! Especially for those weak of heart, and weak of faith. Fear not.. I shall help to guide you to the promised land. The bible says that "the devil will deceive you!" and behold, it has come to pass. Yet another correct prediction of the bible, proving once again that it is the divinely inspired word of our Lord!! Jesus Loves Dinosaurs-- Including the ones with low brain-to-body ratios. I do not think that you guys quite understand the dangers of hell. Imagine a really bad part of town. Hell is much much worse than that. The things that will happen if you go there will be a very unfortunate sight. It is also sad because some other people there are much more evil than you-- like Hitler, Stalin, and Darwin too. If you deny Jesus and want to use the Evolution and time as your God instead, it is a false idol and will not save you. You are not a monkey and have never been a monkey. Stop using excuses to promote your sinful lifestyle!!! Man is more noble than beasts. We have the breath of an eternal soul!!! Common sense should tell you that there are no transitional forms. If you read the bible, you will see that Darwin was wrong. I hate to point this out, but his bogometer reading is nowhere near as high as yours. The funny thing you should know about fossils is that they are not actually bones. They have been supposedly "replaced by minerals"-- which means they are essentially rocks. What a lot of these people do, is carve up stones so that they look like bones and they then have an erector set to make all these fantastical creatures. Now, not all of them a frauds of course, some of them are from the devil instead and should be pulverized to let the demons escape. Obvious Troll Is Obvious. I call Poe!